When Dr Azmi Harun told me about this symposium, I said to him that if the organisers were willing to hire an ambulance to take me there, I was prepared to go. As it turned out to be, IIUM has its own ambulance. So, I am here. I only asked for 15 minutes to say what I want to say regarding an issue which, to me, is of utmost importance to lawyers, parliamentarians, the executives, politicians, indeed to every citizen of this country. Unfortunately, most people are either not aware it or do not seem to realise its implication. We talk about separation of powers between the Legislature, the Executives and the Judiciary. Very often, we focus on the Executives encroaching on the jurisdiction of the Judiciary. But, do we ever think of the reverse, i.e. the Judiciary encroaching on the jurisdiction of the Executives and the Legislature? Article 159 provides that certain parts of the Constitution may be amended in a certain way. The power to amend the Constitution is vested in the Parliament. Nowhere does it say that certain parts or the Constitution cannot be amended. Nor does it say that judges may amend the Constitution to the effect that certain provisions of the Constitution cannot be amended by Parliament. Let me tell the story from the beginning. In 1973, the Indian Supreme Court decided the case of Kesavananda Bharati v State of Kerala, AIR 1973 SC 1461. The court held that Article 368 of the Indian Constitution (on the amendment of the Indian Constitution) does not enable Parliament to alter the basic structure or framework of the Constitution. The effect of that judgment is that certain provisions of the Indian Constitution form the basic structure of the Constitution. The court will decide which provisions of the Constitution form the basic structure of the Constitution on a case by case basis. The court will then use the basic structure principle as the basis of its power to review, and to strike down, amendments to the Constitution enacted by the Parliament which seeks to alter this basic structure of the Constitution. In other words, the power of the Parliament to amend those parts of the Constitution which, according to a Judge or Judges, form the basic structure of the Constitution, is removed, by the Judge or Judges! That case was decided by a slim majority of 7 to 6. It is said that when the case was decided, the perception by the majority bench that elected representatives could not be trusted to act responsibly, was unprecedented. Question: If members of Parliament or the Executives think that Judges are corrupt, does that give them the power to transfer cases in court to be decided by them? I remember reading an article in the Time magazine seven or eight years ago regarding the Parliament of India. I kept that article, but due to moving house and my present condition, I am unable to locate it. The article exposed some unimaginable facts about the members of the Indian Parliament. I’ll tell you just one of them. At the time when the article was written, 17 members of Parliament had conviction for murder hanging over their heads. As their appeals were still pending and their sentences were suspended until the final disposal by the Supreme Court, they were free to stand for election and function as members of Parliament. Since it took about 30 years for a case to be finally disposed of, that period is long enough to cover their whole political career! Those were the circumstances in India then that led the Judges to come out with that and similar judgments. Whatever it is, even if it is true, I say that that is not a justification for the Judges to usurp the jurisdiction of the Legislature. Back in Malaysia, lawyers, academicians and others applauded the judgment. Lawyers were happy because they now had a new argument to support their cases against the government and, with it, the opportunity to make a name (and money) in “developing” the law. Academicians were excited about “a new development in constitutional law” that they could write on or tell their students about. Yet there were those who, at that time, felt that, in this country, the same government, dominated by one party, had remained too long and too strong. At least, with that judgment, the court is there “to provide a check and balance”. Yet there were those who always looked up to the Indian Supreme Court and had strong sentiments for anything coming from India. However, their attempts failed. The Federal Court in Loh Kooi Choon v The Government of Malaysia  2 MLJ 187 rejected it. 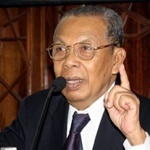 Tun Suffian (LP) and Wan Suleiman (FJ) wrote separate judgments giving reasons why they were not inclined to follow it. That judgment was followed by the Federal Court in Phang Chin Hock v. Public Prosecutor  1 MLJ 70. In 1989, the case was followed by the Singapore High Court in Teo Soh Lung v Minister for Home Affairs and Ors. 2 MLJ 449. Loh Kooi Choon stood as the law of this country for 33 years. One would have thought that the issue regarding the basic structure of the constitution was settled. However, that was not to be thanks, in particular, to one man. Towards the end of his career, Gopal Sri Ram JCA was promoted to the Federal Court. He was a member of the panel that decided Sivarasa Rasiah v Badan Peguam Malaysia & Anor. 2 MLJ 333. Even though he was the most junior member of the panel, he delivered the judgment of the Court. 1. It is not at all necessary for the decision of that case. What was being challenged in that case was the validity of section 46A(1) of the LPA. No one was trying to amend any provision of the Constitution. What was the relevance of the basic structure principle? 2. The Kesavananda Bharati case was followed without analysing the case or the circumstances surrounding it. The learned Judge either brushed aside or ignored the earlier judgments of the Federal Court which had stood for more than 30 years. 3. (This is more important). The court was usurping the function of Parliament to amend the Constitution. Indeed, even Parliament cannot make such an amendment, because Parliament cannot bind itself from making laws inconsistent with the existing laws, provided the procedure is followed. Otherwise, no law can be amended. Seven years later, the Federal Court handed down the judgment in the case of Semenyih Jaya Sdn Bhd v Pentadbir Tanah Hulu Langat (2017) 3 MLJ 561. That judgment, written by Zainun Ali FCJ, relied on the judgment of Gopal Sri Ram FCJ in Sivarasa Rasiah as the authority for the introduction of the basic structure principle into this country, without any question. It also ignored or missed Phang Chin Hock and Teo Soh Lung. On 14th and 15th June 2017, the New Straits Times published my article in two parts titled “Not For Judges to Rewrite the Constitution” and “No Judge is a Parliament.” I understand that Dato’ Seri Gopal Sri wrote a reply. Then, on 29 January 2018, the Federal Court handed down the judgment in Indira Gandhi a/p Mutho v Pengarah Jabatan Agama Islam Perak & Ors and other appeals (2018) 1 MLJ 545. Again the judgment was written by Zainon Ali FCJ. Even though the basic structure principle was not at all an issue in the case, the learned Judge took the opportunity to endorse Semenyih Jaya. As a result, the basic structure principle becomes the law of this country. Perhaps, the happiest person is Dato’ Seri Gopal Sri Ram as can be seen from his press statement dated 31st January 2018 – see Freemalaysiatoday.com. I must emphasise that I am objecting to the introduction of the basic structure principle invented by the Indian Judges on ground of principle and nothing else. We cherish the doctrines of independence of the judiciary, separation of powers, rule of law, Parliamentary democracy and supremacy of the Constitution. Now Judges are giving themselves the power to amend or rewrite the Constitution. I stand by what I had said in my judgments: No Judge is a Parliament. If the doctrine of separation of powers were to have any meaning, all the three branches of the government i.e. Legislature, Executive and Judiciary must respect each other’s jurisdiction. I hope our members of Parliament are aware of what is happening. What recourse do they have? The answer is to revert to the Constitution. The power to amend the Constitution is vested in the Parliament. In the name of parliamentary democracy and separation of powers, all members of Parliament, whether they are from the government or the opposition, should come together and move a bill to amend the Constitution to the effect that Parliament may amend any part of the Constitution provided that the procedure laid down by the Constitution is followed. The original position should be restored. If you would like to read a more detailed discussion on this subject, please read my article titled Not For Judges To Rewrite The Constitution available on my websites. I have said what I want to say. Think about it.